2017 had a lot to offer: marriage for all in Germany, the 10th anniversary of the hashtag, and of course, many new food trends. Some of them made your mouth water while others just left a big question mark over our heads. Here’s a review of this year’s best and worst! We all love beautiful food and dishes, but we were very thankful that this year an underdog got some attention: culinary misfits! A heart shaped potato or a carrot with two legs taste just as good as their flawless friends and prove: Diversity is great! When it comes to some food trends, sometimes you can’t help but roll your eyes. That’s the case with any superfood powder. It’s not only that açai, wheatgrass, and goji berries are no more super than any other food within a balanced diet—now they also come in the shape of easily digestible powders in supermarkets. They promise detox, cleansing, and vitality, but why not just eat fresh fruits and veggies instead? Many people liked cauliflower before, but this year the purple version of it got all the love. The high amount of anthocyanin (which is also in red cabbage and beetroot) is responsible for its color. Good for us, because anthocyanins have a strong antioxidant effect. And it doesn’t end with cauliflower—there’s already purple asparagus and sweet potatoes, and we can’t wait to eat them. The clean eating trend has encouraged many people to get more creative in the kitchen. However, a few lines were crossed that I would like to draw again: When possible, toasts should be made of bread, please! Anyone who ever tried a sweet potato toast knows what I mean—it takes forever and doesn’t taste that good. Fermenation is not a new trend, but it wasn’t that popular until this year. After all, dill pickles are not called fermented cucumbers and ginger beer is not known as fermented ginger water. But, now the food trend is real and people are getting creative in the kitchen! Carrots, turnips, cabbage, and more are broaching new territory and developing new, exciting flavors—delicious! First things first: We love kimchi. As we just said, fermentation is great, and adds exciting flavors to a variety of dishes. The problem with kimchi is not the taste, it’s that it seems to be on every menu these days, and that it’s not always done well. We don’t all have to jump on the same bandwagon for the sake of trendiness! Plus, it’s boring to see the same things at every restaurant; variety is the spice of life! 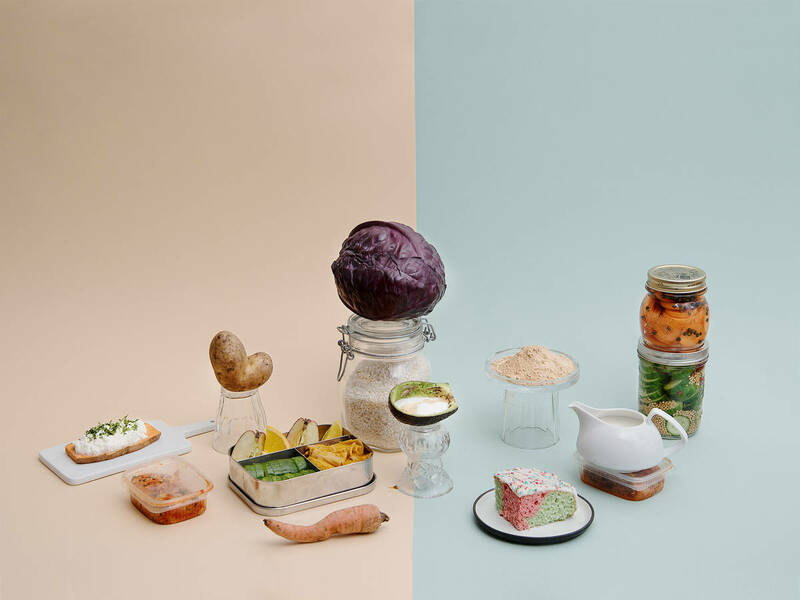 Going to a regular supermarket often comes with two problems: First, we’re surrounded by countless products with plastic packaging and, second, they often come in portion sizes that we can’t possibly finish before it goes bad. In the end, most of it ends in the garbage, and this is just wrong. Because of that, many shops now offer unpacked food and more and more companies produce sustainable containers for shopping. In Germany, there’s even a large supermarket chain that allows customers to bring a lunch box to shop at the meat counter. Sounds retro, but it is actually quite progessive. Now that we’re talking about „packages,“ here’s one that we can skip as well. Avocado latte? It sounds as stupid as it is—coffee served in an avocado peel. After a café in Australia started this „funny“ joke, people worldwide joined in. How are you even supposed to drink it? It already started with salad jars and colorful Bento boxes, but this year meal prep reached a new level. There are already cookbooks about pre-cooking food and the real meal prep pros offer instructions for how to prep meals for a whole week in advance. You don’t even have to go that far, but the general thought is one to hold on to: Start cooking more! It saves money, waste, and always tastes better. Was your lunchbox rainbow-colored once-upon-a-time? The rainbow and unicorn trend came, saw, and unfortunately is still conquering. Bagels, cakes, and milkshakes still wallow around in color shades from yellow to blue. What first looked like a quest to turn the food world into a Katy Perry video is getting a little old. Allegedly, flamingos are the new unicorns. Is that any better? Let’s be prepared for pink fries in 2018. What are your favorite or least liked food trends this year? Share them in our comments!